CNG: Printed Auction Triton XXII. LUCANIA, Metapontion. Circa 540-510 BC. AR Nomos (28.5mm, 6.89 g, 12h). Triton XXII, Lot: 18. Estimate $20000. Sold for $26000. This amount does not include the buyer’s fee. LUCANIA, Metapontion. Circa 540-510 BC. AR Nomos (28.5mm, 6.89 g, 12h). 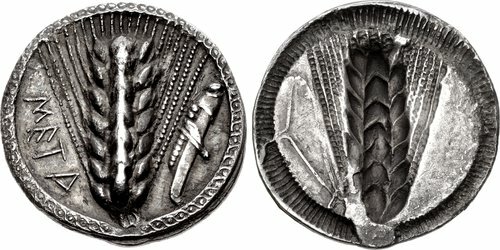 Ear of barley with seven grains; META down left field, grasshopper upward to right / Incuse ear of barley with seven grains; outline of dolphin upward to left. Noe Class V, 100 (same dies); HN Italy 1472; SNG ANS 206 (same dies); Basel 130 (same dies); Gillet 132 (this coin); Kraay & Hirmer 229 (same dies). Near EF, toned, die breaks on reverse (diagnostic for die). From the Gasvoda Collection. Ex Numismatica Ars Classica 92 (23 May 2016), lot 88; A. D. Moretti Collection; Numismatica Ars Classica 18 (29 March 2000), lot 22; Numismatica Ars Classica 9 (16 April 1996), lot 57; Leu 42 (12 May 1987), lot 46; Charles Gillet Collection. From the consignor: The most interesting type of the incuse coinage of Metapontum certainly must be the issues which include the locust (or grasshopper) design detail, as here. There are a number of variations. Here it is paired with a dolphin in outline. The locust would have been a serious threat to the agricultural community and likely the dolphin relates to Apollo who would have been seen as the God who eliminated a plague of these insects in the year this coin was struck.